Considering everything, TunnelBear does not earn a recommendation for this review. There are faster and more secure VPN services available, which also offer more features – see the best VPN service report for the latest recommendations. Tunnelbear VPN is a service offered by Tunnelbear Inc. that appears to be based in Toronto, Canada. Canada is not a good privacy jurisdiction, and we explain why in the VPN for Canada guide. Shortly after this review was first published, however, TunnelBear sold out to McAfee – the United States cybersecurity company. Now that TunnelBear is owned by a giant American cybersecurity company, it’s difficult to tell what the future will hold. According to its website, TunnelBear is still being operated out of Canada, even though it is now owned by a US company. As we have covered before, Canada is not the best jurisdiction for a VPN because it is a member of the Five Eyes surveillance alliance. This is also one reason US VPN services are not a good choice, as explained in the VPN for USA guide. Custom Tunnelbear apps for desktop and mobile devices. TunnelBear also offers browser extensions, which we will cover in detail further below. Linux – TunnelBear supports Linux, even though they currently do not have a dedicated Linux app. 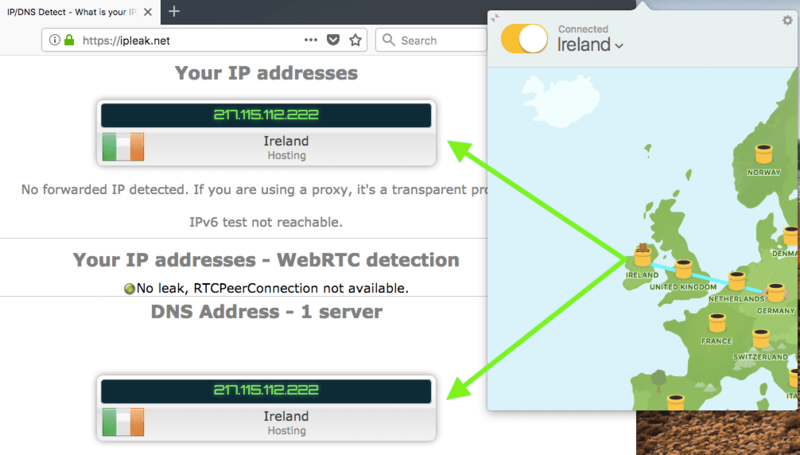 Routers – Using a VPN on a router is unfortunately not possible with TunnelBear VPN at the moment. See the VPN router guide for additional options. Overall TunnelBear is somewhat limited when it comes to supporting a diverse array of operating systems and devices. For example, there is no option to download the OpenVPN configuration files for use on routers or with third-party VPN applications. As an alternative, ExpressVPN (review) offers a large selection of applications and support for different devices, along with a 30 day money-back guarantee. TunnelBear offers good data encryption using the 256-bit AES OpenVPN cipher for Windows, Mac OS, and Android. The IKEv2 cipher is used for iOS, which is the best option at the moment due to the iOS configuration settings. Here is an overview from the TunnelBear website. TunnelBear uses good encryption standards. Both OpenVPN and IKEv2 are secure and reliable encryption ciphers. Each has pros and cons. OpenVPN is open source, but it requires the use of a third-party client and is more CPU-intensive. IKEv2 can be used natively on various devices (no app required) and runs with less CPU, but it is also not open source. 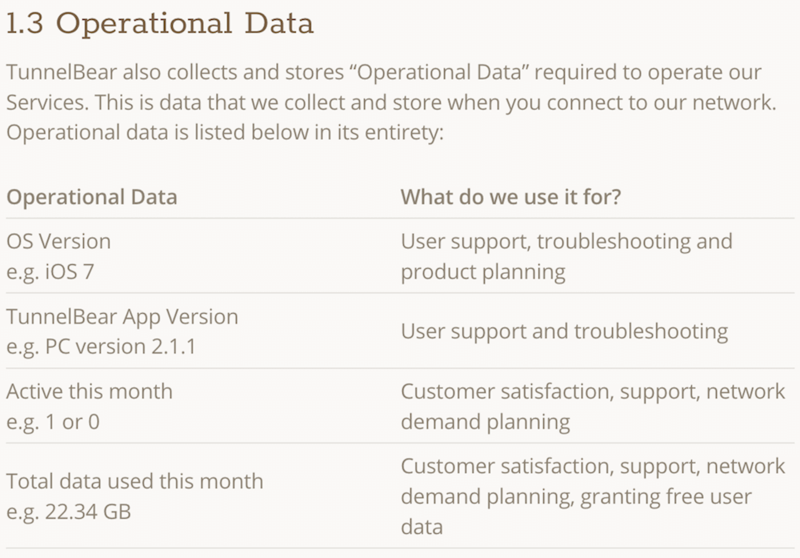 The basic price tiers for Tunnelbear are free (limited to 500 Mb of data), $9.99 (monthly), and $4.16 (annually). These plans are respectively referred to as Little, Giant, and Grizzly in the pricing plans below. Note: Be careful with free VPN services. 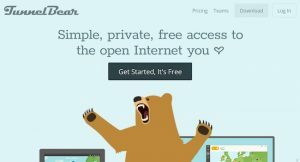 Many free VPNs are dangerous, which is why most people are better off using a VPN with a free trial, such as TunnelBear. You can get more details about the different pricing plans on their website here. If you’re looking for better deals, check out the VPN coupons page. You can also pick up an ExpressVPN coupon for three months free, or a NordVPN coupon for 75% off. These are two popular VPNs that performed well in testing and are based in privacy-friendly jurisdictions. One interesting aspect of Tunnelbear is that there are no refunds. Most VPNs that offer a free trial or free version do not offer refunds, or at least give you a very limited window for a refund. For example, VyprVPN (review) offers a three day free trial, but after that, there is no refund. The official policy is that all payments are non-refundable – but they may grant certain exceptions depending on your situation. Note: there are a few other VPNs with free trials that range from a few days to a certain amount of bandwidth in a month. 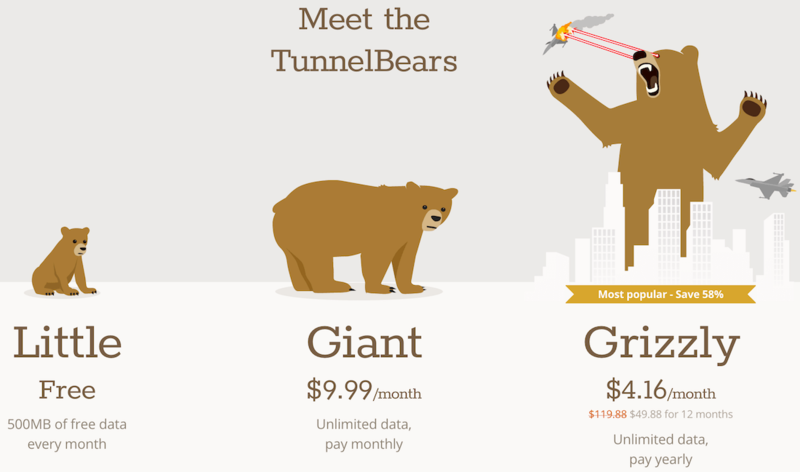 TunnelBear free VPN limits you to only 500 Mb of data per month, which for most people, won’t last very long. However, unlike with other free VPN services, such as Windscribe (Windscribe review), TunnelBear free VPN gives you access to the entire server network (with the exception of the Australia server). More data – You can get more data by tweeting about TunnelBear. This will give you an extra 1 GB of data, but that still probably won’t last long for most people (solution = upgrade to the paid plan). After running out of the 500 MB of free VPN data, you will get the alert below and then not be able to connect to any server. It did not take long to run out of 500 MB of data. Consequently, you will probably need to upgrade to the paid VPN service. But the 500 MB of data will be enough for you to at least test out the VPN before buying. Overall, TunnelBear did well in testing. TunnelBear offers a good leak protection option which is called VigilantBear. This feature acts as a kill switch to block all traffic when there is no active VPN connection and can be activated directly within the VPN application. This is the TunnelBear leak protection and kill switch. I tested this out and found it to work properly without any issues on Windows and Mac OS. 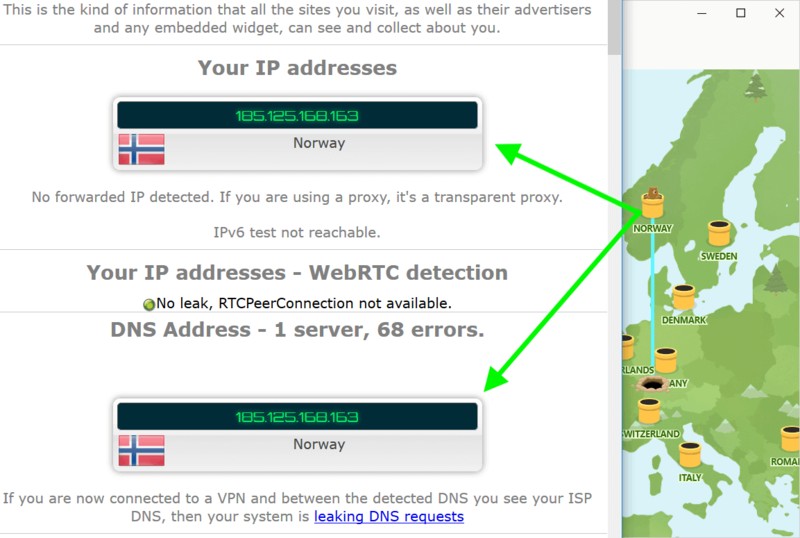 Windows – Here is a leak test using the TunnelBear Windows VPN client with a server in Norway (no leaks). I did not find any leaks or issues with the TunnelBear Windows VPN client. Setting up and using the VPN was easy to do and everything worked well. Testing for the TunnelBear Windows client was done using a Windows 10 desktop. Mac OS – I really liked the look and feel of the TunnelBear Mac OS client. You can click a simple dropdown from the Mac OS dashboard to select your server or modify the settings. Everything worked well without any problems, bugs, or leaks to report. No problems with the TuenelBear Mad OS client. Testing for the TunnelBear Mac OS client was done using the latest version of Mac OS High Sierra. It is important to remember to enable VigilantBear – the leak protection feature – to be protected against leaks. As of right now, it does not look like this feature is enabled by default. You can test for leaks and any other issues using the VPN test guide. TunnelBear provides an obfuscation (Stealth VPN) feature called GhostBear. This basically hides (obfuscates) your VPN traffic to protect you against deep packet inspection (DPI) and VPN restrictions. Obfuscation is a must-have feature where VPNs are getting blocked. This is often the case in restrictive countries, such as China and Saudi Arabia, as well as with work or school networks. There have also been reports of internet service providers interfering with VPN traffic. I’ve seen different websites claiming that this is happening in both the United States as well as some countries in Europe. TunnelBear’s obfuscation could potentially solve that problem. The GhostBear obfuscation feature is available on Windows, Mac OS, and Android. You can enable the GhostBear feature under Settings > Security as seen below with the TunnelBear Windows client. GhostBear is an obfuscation feature to get around VPN restrictions. Tunnelbear uses Obfsproxy as its primary obfuscation feature. Note: I have not heard any reports of TunnelBear working well in China, since the vast majority of VPNs there are getting blocked. See the best VPN for China guide for the latest test results. TunnelBear did OK in speed tests, but back-to-back testing with ExpressVPN shows that there is much room for improvement. My baseline speed (without a VPN) for testing was about 100 Mbps. Before discussing the results, it’s important to remember that there are many factors that influence speed. Some of these factors are controlled by the VPN, such as server quality and bandwidth load. Other factors, however, are outside of the VPN’s control, such as your network settings, computer CPU, and potential interference from your internet provider. With that disclaimer, let’s take a look at the TunnelBear speed test results. Here was a nearby server I tested in Switzerland, which gave me a download speed of 54 Mbps. 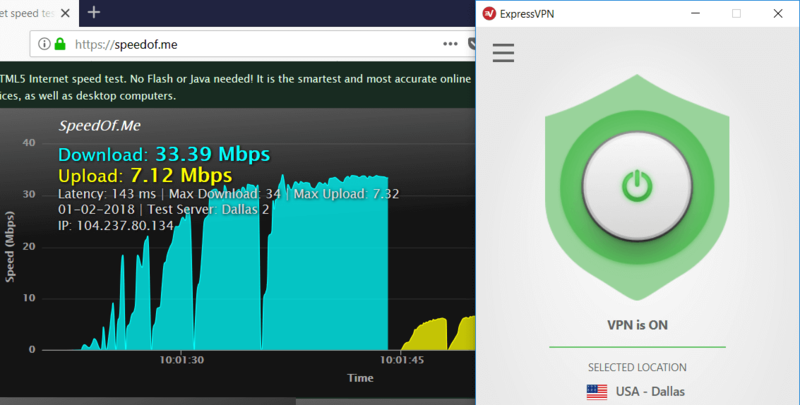 I also ran some back-to-back comparison speed tests with TunnelBear and ExpressVPN. TunnelBear’s speed with a VPN server in France was about 34 Mbps. After running the test with TunnelBear I also ran a test with ExpressVPN. 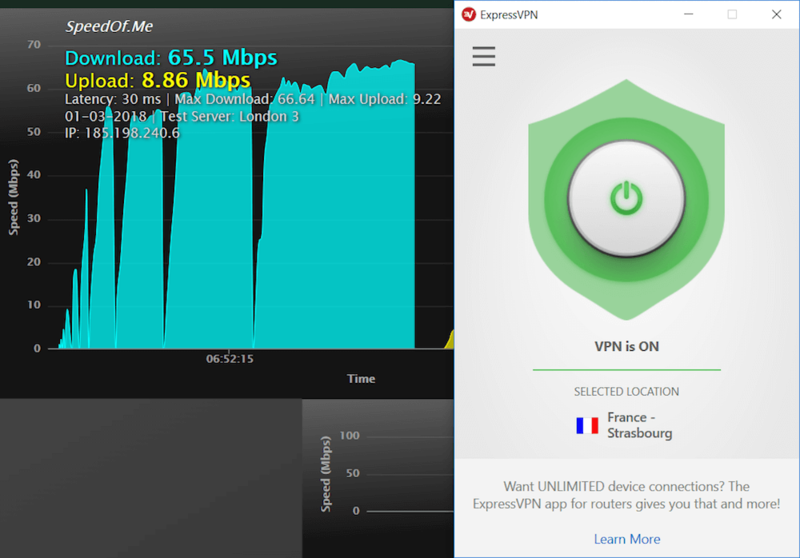 ExpressVPN’s server speed in France was about 65.5 Mbps. I also tested a few VPN servers in the US. With TunnelBear, the speeds were still decent considering the distance between my location (Europe) and the VPN server in the US. Here are the comparison results. TunnelBear US server: 13.87 Mbps download speed. And now for the comparison speed test. Here is the ExpressVPN US server: 33.39 Mbps download speed. Overall I found TunnelBear to offer pretty good speeds. Aside from the screenshots above, I also ran tests with other servers in Europe as well as Canada and Australia. The results were OK throughout the server network. I did not have any issues with dropped connections or other network problems. In comparison to ExpressVPN, however, TunnelBear is not quite up to par. 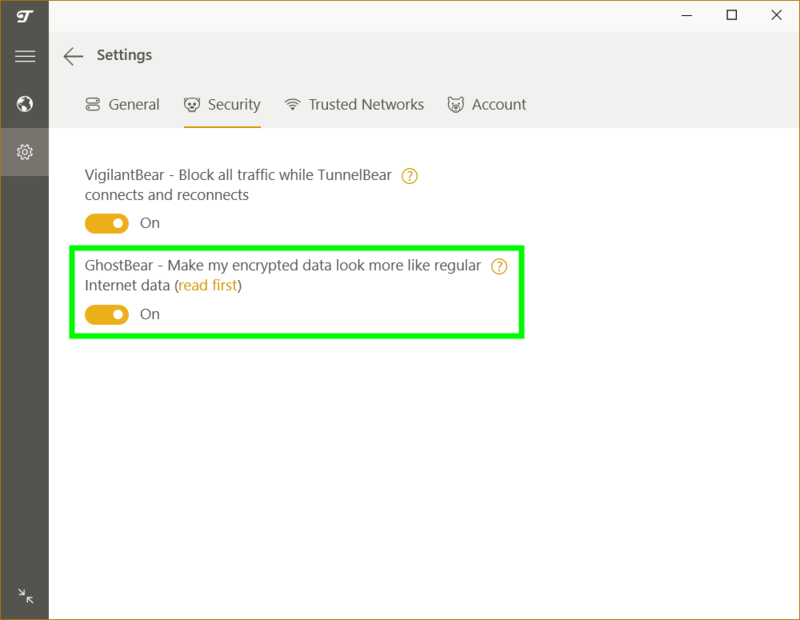 The TunnelBear Chrome extension is a lightweight encrypted proxy that you can easily control from the browser window. I tested the TunnelBear Chrome extension for this review and found it to work well. You can download the browser extension and test it out for free directly from their website here. Why use the Chrome extension when you can already use the desktop VPN client? In addition to the benefits listed above, you can also layer your encryption by using one server location with the VPN client, and then using a different server with the TunnelBear extension. Additionally, you could also use this as a split tunneling option. In other words, you could encrypt your traffic over one server with a Chrome browser, and then encrypt traffic over a different server with a Firefox browser using the desktop VPN client. Here is the TunnelBear Chrome extension in action, which you can see in the upper right corner of the browser. I also tested out running one VPN server on the desktop VPN client and using a different server through the Chrome extension. For everything done in the Chrome browser, this essentially creates a double-hop connection with traffic being encrypted across two separate servers. Your IP address and DNS requests would match up with the desktop client for everything outside the Chrome browser. 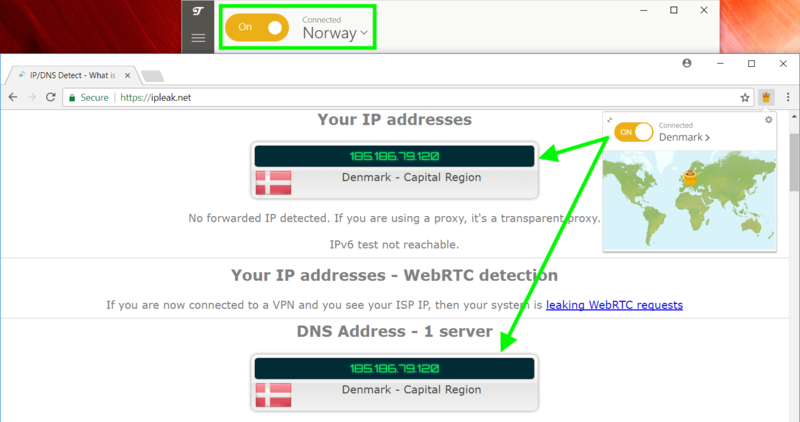 Here you can see that I’m connected to the Denmark server with the Chrome extension, while at the same time the desktop VPN is also encrypting all traffic through the Norway VPN server. The TunnelBear Chrome extension can be combined with the desktop VPN client for further protection. Firefox – TunnelBear told me that the Firefox extension is currently in development. Opera – TunnelBear also offers a full Opera browser extension, which functions in the same way as the Chrome extension tested above. You can get more information on the Chrome and Opera browser extensions on the TunnelBear website. Now we will take a look at the fine print. This is what is being logged when you use TunnelBear VPN. While logs are not necessarily a bad thing – and necessary for most VPN services to operate – the contradictory statements are somewhat concerning. 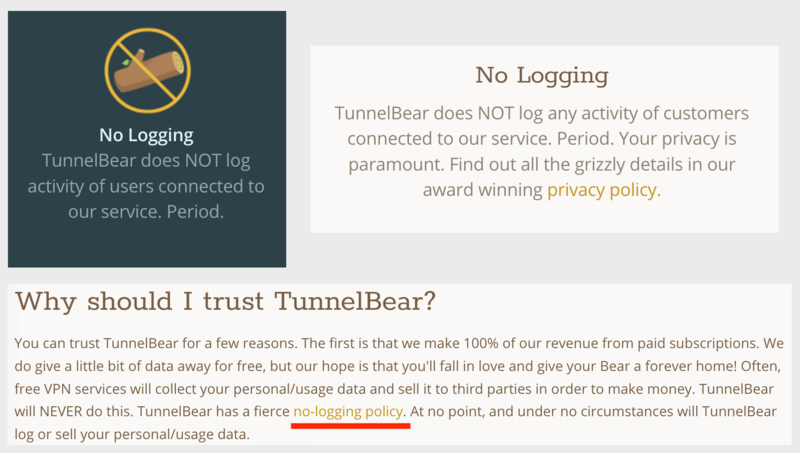 It would probably be better if TunnelBear replaced the “no logging” statements with “no activity logs” or something similar, which would be more accurate and align with their policies. To be fair, there are many VPNs playing “word games” when it comes to logs – especially since there is no definition of what “no logs” really means. This is further explained in the article VPNs are Lying About Logs, which focuses mostly on an example where a “no logs” VPN service logged customer data and handed it over to the FBI (US authorities). TunnelBear offers a decent selection of servers around the world. They currently have servers in 20 different countries. I did not see any kind of server status page that would display real-time bandwidth and server info. You can get more details on the TunnelBear website. Does TunnelBear VPN work for unblocking Netflix? Based on the latest tests for the Netflix VPN report, TunnelBear does not work with Netflix. However, this is a cat-and-mouse game that changes over time. I sent TunnelBear support a few random questions while testing out everything for this review. With every inquiry, my question was answered within a few hours (sent during business hours). Based on my interactions, the support team seems to be doing a great job of answering questions in a timely and professional manner. You can get in touch with support directly from the TunnelBear website in the members area. TunnelBear offers responsive and professional support. There is no option for live chat support, but that does not seem to be too concerning as the email support was very responsive. Additionally, it appears that TunnelBear handles all support with in-house professionals (no third-party support in the Philippines). 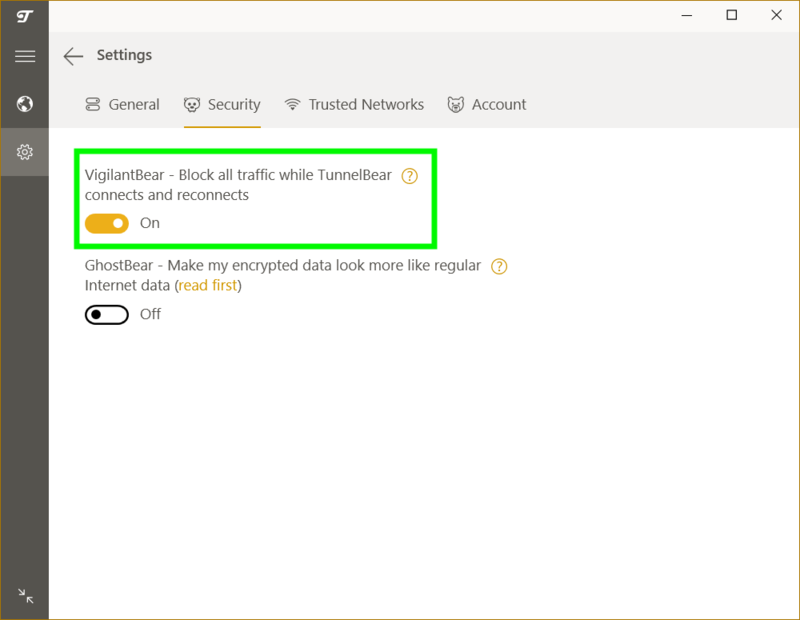 TunnelBear is a growing VPN service that offers user-friendly applications, good support, and mediocre performance throughout the VPN server network. I found the Windows and Mac OS applications to perform well in testing without any leaks or problems to report. The bear theme feels be a bit overdone, but the underlying VPN seems to be an OK choice at a reasonable price. For other users who want to better performance and more features, there are probably some better options worth considering. However, if you want a simple and user-friendly VPN application, TunnelBear may be a good choice. If you have used TunnelBear VPN, feel free to share your honest review (good or bad) below. About 11 months ago, I needed a VPN. Being a VPN newbie and not doing any research I decided to try TunnelBear’s free option. It was easy to use as I just wanted a plugin for Chrome or Firefox to route browser data through the VPN. It served my basic needs and was idiot-proof so I signed up for a 1-year subscription. After 11 months I found restoreprivacy.com and your VPN reviews. After reading the VPN reviews I think I’ll cancel my TunnelBear subscription and sign up for NordVPN. Like you said in your TunnelBear review, TunnelBear is not bad but there are better options available. The bear enchantment have finally disappeared. Where do I start? 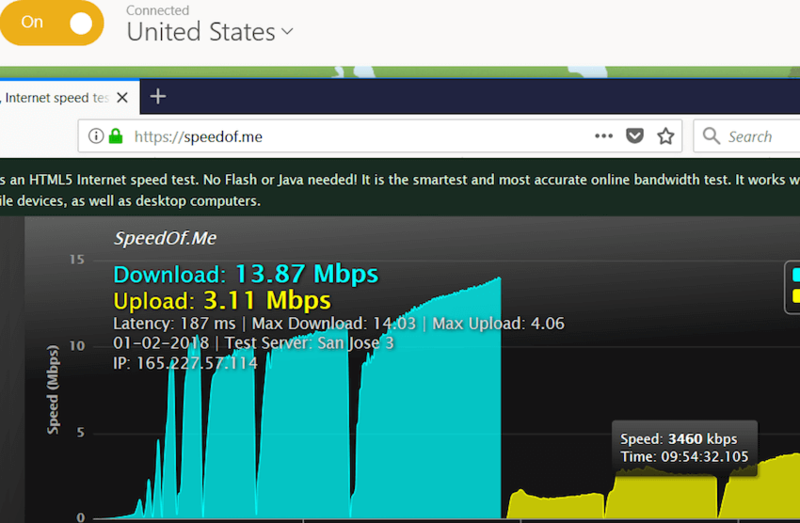 Speeds are ok with closest server, however, it feels like they throttle the speeds when the ping is very high and you try to connect to servers that are far away. Ghostbear only works on low level blocking, does not work in China or BBC iPlayer, Netflix. Disconnects quite frequently. Quite disappointed. I am looking forward to the end of my subscription and will most probably switch to ExpressVPN or NordVPN. I have been using Tunnel Bear for 10 months now. It was a good price for a year subscription. It seemed to work fine with little problems for a while. This year, 2018, their speeds have dropped dramatically, as well as the service dropping and reconnecting often. I average around 80mbps without Tunnel Bear but with Tunnel Bear my speeds drop to around 5mbps-20mbps consistently. I have tested all their servers and find little speed difference. It has become practically unusable. I was thinking that they were throttling my use, but I don’t know. I will not be continuing my subscription. I also do not like their selling out to McAfee. I’ve been using TunnelBear for a while and it has never been too impressive. Yes, it is easy to use, yes it is simple, but it’s not really “great” in any way. The bear thing gets old after a while. Speeds are very mediocre. Now that TunnelBear management has decided to SELL OUT to a giant US cybersecurity company (McAfee) I will be taking my business elsewhere. TunnelBear doesn’t care about their customers anyway, they just handed all customer data over to a giant US-based tech firm. Not good for privacy, mediocre performance, and now owned by a US mega corp. Adios TunnelBear! !